We started out taking Gazi Mustafa Kemal Ataturk’s speech to Anzac mothers in 1934 as our main reference and named our project “TWO TRENCHES ONE LETTER”. 1.To establish a bridge of peace between Turkish and Australian youth. 2. To commemorate our martyrs as well as the Anzac sons / soldiers after 100 years. 3. To remind everyone that the children of Mustafa Kemal Ataturk will always be faithful to the words he said in 1934. To show our students that Dardanelles was not only a battlefront, but also it holds crucial stories about people and therefore, to arouse awareness about history. 5. To let the new generations learn about the heros like Martyr Lieutenant İbrahim Naci, First Lieutenant Saffet (Pozantı) and Lieutenant PenistanJames Patterson, PlevneRyan (Charles S. Ryan, Mehmet Şefik, Hüseyin Avni. We started our project in January 2015 and decided to end it in May 2015. • Before starting the project, we initiated informative studiesfor our students about Dardanelles War. We told them about the war and stories of people in the lessons. • We made use of NTV History Journal issue Mart 2015 and talked about the dramatic life of Martyr Lieutenant İbrahim Naci. We read parts from İbrahim Naci’s diary. We gave the students research tasks on Dardanelles War and so introduced him and other Dardanelles heros to the new generation. • We watched the movie ‘Water Diviner’by Russel Crowe with our students and discussed about the movie in our classes. • We tried tohelp our students visualize the atmosphere of that time by pictures, journals, videos and photographs. • In the lessons,we talked about the heroes of Gallipoli, Plevne Ryan (Charles S. Ryan), 27th Regiment, 57th Regiment, Saffet Pozantı, the hill that is 261 meters above sea level, what the soldiers lived through in Anzac Cove and many more things about Dardanelles. • Inspired by Mustafa Kemal Ataturk’s speech in 1934, our students wrote ‘letters’ and postcards. • Our students’ letters are the base of our project. These letters were written to two different addressees. To Anzac families and grandchildren. To Ibrahim Naci, in memory of all our martyrs. • Our students wrote letters addressing Anzac families and grandchildren. It is planned that the letters will be translated to English and conveyed to Anzac families through Australian embassy. Within this framework, we contacted the Embassy and other channels. • In addition to the letters, our students made ‘postcards’ with the help of our art teachers. On the front face of the postcards, there are “Anzac Memorial” and “57th Regiment Memorial”. Turkish and Australian flags were placed in the middle using moulage technique. The flagsticks were designed as olive branches. • Inside the postcards, “Turkish Soldiers’ Caps” and “Anzac Caps” were placed using moulage technique. Under these caps, Gazi Mustafa Kemal Ataturk’s speech and an Anzac mother’s reply were written. • The first part of our project consists of the letters of Lieutenant İbrahim Naci. As you know, Turkey was informed about this name with the help of Sayit Ahmet Sılay. After telling our students about Ibrahim Naci’s life and his diary, we immediately asked them to write letters to him. They were so moved by him that they wrote these letters to him and to all the martyrs on his behalf. Then these letters, which were written by our 12-13 year old students and which were full of emotion and historical awareness, were completed. These letters were directly sent to Canakkale Museum which was founded by Seyit Ahmet Sılay. Mr. Seyit will display these letters there. This way, Ibrahim Naci is remembered once more and the letters have the chance to be viewed by future generations. • To enhance all these works, we also designed posters in memory of the 100th anniversary of the Gallipoli War. We posted these on the walls of our school and gave them as presents in official visits. • We designed a T-Shirt with “Anzac Memorial – 57th Legion Memorial” on it. They are being printed and when they are ready, our students will write their thoughts in a sentence and sign it. These signed T-shirts will be sent both to the Australian War Memorial and Canakkale Museum. • We also designed a “100th Anniversary Medallion” to be sent to Anzac Familiesand to the Australian War Memorial. There two sides of this medal. On one side, there is the “Anzac Coat of Arms”, and on the other, there is the “Canakkale War Medal ”. • All these materials will be sent to Australian War Memorial and Canakkale Museum like a “Soldier’s Dowry”. • We contacted some authors and cartoonists and asked them to write a letter and draw a caricature in accordance with the “Gallipoli Spirit”. The ones that are sent to us are also included in this project. • Finally, we proposed that all TED schools use our specially designed “Canakkale logo” in formal correspondences. With these letters, postcards and all the other materials, we intended to create bonds of brotherhood between the two sides of this war. 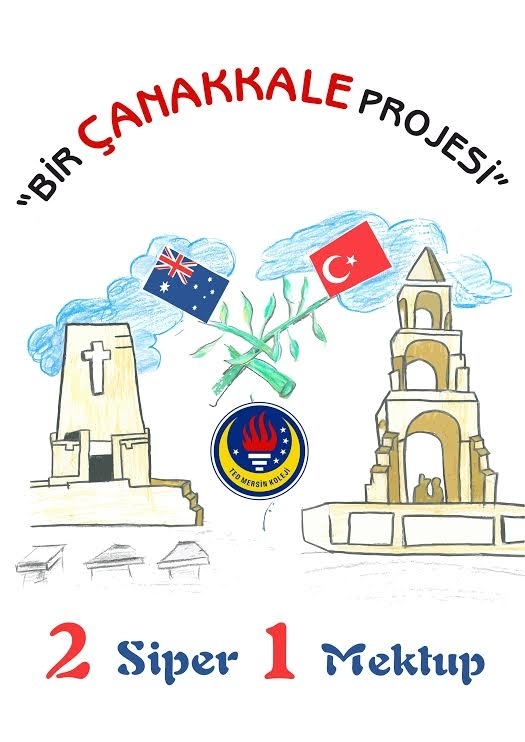 There’s no way to tell if these materials will last but we believe they will help from a strong friendship between Anzac and Turkish teenagers and it will also create Canakkale Spirit for future generations. We should never forget that every breath we take, we owe to the last breath of a martyr. So, it’s our lifelong debt to commemorate and remember the people who gave their lives for their country. We must remember them every year, with every breath. This work is dedicated to all heroes of Gallipoli Campaign who lost their lives. May they rest in peace. I'm writing this letter to you from Turkey. My name is Sezer. I'm a student at 7th grade and I'm 13 years old. I know that your great grandfather lost his life in the battle of Galipoli, and that you make "Dawn Service" in Anzac Bay on the 25th of April every year. My aim is not to give you sorrow by reminding you of the sad memories of the past. It is to make friendship connections with you. That was a war and there were lots of losses. Yet, neither Turkish nor Anzac soldiers spared mercy from each other despite the war. They threw gifts to each other from the trenchs. They did all of these despite their oaths to kill each other. If our ancestors had shown this mercy even in war time, why shouldn’t we in peace time? Today, the same sun rises on the tombs of both our ancestors and sets by shining brightly. They are resting in peace on the lands of our country. I would like to tell you a decision we took in the family. I would like to host you in my hometown in this year’s commemmoration ceremonies. I would be very happy if you accept my invitation. We can commemorate our ancestors together. For the first time in my life, I will write a letter to someone’s mother from an unknown period that I did not experience myself. When it is about a mother, I think I am old enough to know that the feelings do not change based on a period of time or nationality. Whatever your name is; you have no difference from my mother. Whatever the reason is, right or wrong, whether you are on the strong or the weak side, to send your child to a war is the most terrible thing that can happen to a mother. Everyone who has read the Çanakkale War memories will know; apart from the cruelty of 10-15 meters’ distance between battle fronts, it also caused unexpected friendships, unforgettable stories, and maybe one by one the soldiers have signed to create spirit of this land. Your son is having his endless sleep at our-your home. All the doors of this holy country are all open to you and your country forever. With my regards and greetings as a son of yours. One of Mustafa Kemal ATATÜRK’s children. Your sons came from far away lands to our country to fight.They had left their families, houses, and all the loved ones. They had fought for their country and gave their souls. But there could only be one winner. In Gallipolli both sides lost lots of people. We can say three words to explain what Anzac people lived through: mistakes, deaths, diseases. Even though it was so bad for us to lose our soldiers in Gallipolli, today those pains turned into a bond of brotherhood and friendship between us. Those past years prove how meaningless guns are. I am inviting you to commemorate your ancestors. Let the children of the two countries set an example of peace and love on the soil of Gallipolli. Never forget that Gallipolli will always be remembered as the home of heroism and courage by us. Anzacs who died in our country will always be protected by us.